Showing 18 articles from May 12, 2013. Kris Camenzind, executive director of the Crisis Support Network, has short- and long-term goals for the Pacific County agency. Editor’s Note: Below is the first part of a two-part story. Part II will be published in a future Herald. Last week, Americans followed the amazing story of the escape of three brave young women from a man in Cleveland, Ohio, who had kidnapped, raped and held them captive for 10 years or more. Follow-up news reports revealed the abductor had abused his ex-wife years before he began grabbing young girls off the streets to hold them captive in his home. The Raymond Fire Department responded to a property burn fire Sunday at 2:49 p.m. The property is owned by Ron Stoller. In the absence of a carnival for this year’s Egg Days, the Egg Day Committee is reaching out to community members to help come up with and implement entertainment ideas for the festival. Organizers say they are hoping to create the feel of an “old time county fair” and are hoping to find a large number of volunteers. Recommendations have been performances by local student bands, face painting and games, but the committee is open to ideas and stresses they will not be charging for the use of space. Volunteers have spend the last few weeks placing the final touches on the Veterans Wall of Honor in Toledo, just in time for Memorial Day. 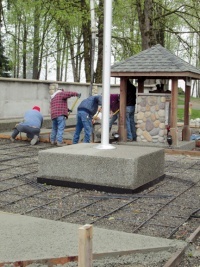 Two recent concrete pours have completed the plaza, built around the original monument erected there in honor of Toledo's own Melvin Arnold Holland who fell with 11 others in Phou Pha Thi, Laos, on March 11, 1968. Four benches have been added as well, with lighting surrounding the display featuring both American and POW/MIA flags. Warm sunny days can be great for growing crops, but can wreak havoc on livestock without careful attention. Just like plants, the heat can overcome animals who are not properly hydrated, but more can than leaving water out can go into keeping your animals healthy. A normal animal will need 2 gallons of water per 100 pounds per hour when temperatures start to get above 80 degrees. Be careful to refill water sources regularly, whether or not they are empty, as warm, stagnant water is a breeding ground for unwanted organisms. Watering vessels also need to be cleaned regularly, as warm days can cause algae to grow on the walls of said containers. Make plans to travel out to the end of SR 506 (at I-5 Exit #59) this weekend for another of Ryderwood’s fine Arts & Crafts Fairs. That’s Friday & Saturday and the hours are from 10 a.m.–4 p.m. The variety of handcrafted items from fine art, to jewelry, to trapunto quilting will make it well worth the drive, which is lovely this time of year. Additionally, there will be a fine assortment of flowers, plants, shrubbery and yard art. David Douglas, a Scotchman, arrived at the Hudson’s Bay Company in Astoria in 1840. He was not interested in the fur trade or for new territory for his government. He was a botanist, and he came to examine the things that grew in the heavily forested Cowlitz region. The Hudson’s Bay Company welcomed him and offered him hospitality, but he proved to be an unappreciative guest. On one of his trips, he traveled up the Cowlitz and back. He told about keeping Cowlitz Indians in awe by dropping effervescent tablets into a cup of water. The Cowlitz onlookers assumed the resulting agitation meant that the water was boiling, and when Douglas drank the bubbling liquid they considered him to be big medicine. Last chance to get your brick for the Veterans Wall of Honor before Cheese Days. Call Bob at (360) 864-8335. New Life Church sets the table Wednesdays 5:10-6 p.m. Menu items change weekly. Donations accepted, not required. Watch for upcoming Summerfest. Call (360) 864-4366. Congratulations to the recipients of Hope Grange’s Educational Scholarship! Jacquelyn Johnson, who is currently attending Central Washington University, and Mick Rohman, who is enrolled at Wenatchee Valley College, each received $500 towards their education. Both are related to Hope Grange members. The Olequa Senior Center’s BIG BIG Breakfast is all set for Saturday from 8 to 10:30 a.m. In addition to coffee and juice, they will be serving sausage, ham, biscuits and gravy, eggs, hash browns, pancakes, and waffles, and all for $5. For more information, please contact the center at (360) 785-4325. Vicki passed away the morning of May 10th, 2013. Vicki was born December 23rd, 1958 in Waynesboro, Penn. to Judy Duckworth (Nelson) and Elwood Smith. The City of Vader is again offering water system hookups after Lewis County confirmed there is no moratorium against the city during the May 7 Vader City Council meeting. Vader officials had stated they were under the impression a moratorium was in place from the Department of Health (DOH) preventing new water hookups after the system began experiencing massive water leaks in 2009. Lewis County Public Works Director Tim Elsea clarified Vader may not be able to acquire new hookups but can still offer from an existing pool of approved hookups to its water customers. The name Moore is nearly synonymous with track and field in the local area. 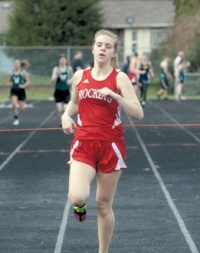 Castle Rock senior Austin Moore is the reigning 400 meter state champion while cousin Elizabeth Moore dominated the 200 and 400 meters for Castle Rock in the Trico League championships Friday, and still their Freshmen cousin, Courtney Moore at Toledo, is raising a few eyebrows with her sprinting performances. Previously-undefeated Montesano ended Castle Rock's baseball season Friday in the District IV 1A Tournament with a 13-1 thumping of the Trico League Champions. In the first round of the tournament held on Tuesday, surprising Tenino took a first round victory from the Rockets. CR arrived via a 12-8 victory over La Center in a loser-out game. Nate Williamson went 2 for 3 with two doubles in the game. He had two doubles and five RBIs. Andy Voelker, Austin Elf, Mason Klingberg, T.J Catlin and Cole Beckers had two hits apiece. Local authorities will be ramping up efforts to reduce the number of distracted drivers in the area though an enforcement campaign starting next week. Taking place between May 20 and June 2, officers with the Centralia, Morton, Toledo and Winlock Police Departments, the Lewis County Sheriff’s Office and the Washington State Patrol will be on the lookout for distracted drivers who are texting, talking on their cell phones, fiddling with a GPS or any other activity that may take a driver’s focus away from the road. This effort is mean to mirror the “Click It or Ticket” campaign, according to authorities, who sated such efforts were able to increase the use of seatbelts by motorists from 82 percent in 2002 to 97 percent today. A Winlock man was arrested for DUI after mistakenly driving the wrong way down a one-way street in Centralia May 7, according to the Lewis County Sheriff’s Office. Brian T. Bircher, 44, had been driving the wrong way down N. Gold St. near the intersection with Union Ave. at around 9:30 p.m. when he was contacted for the traffic infraction by a deputy, who found Bircher to be under the influence of intoxicants. Looking for quick and reliable car service that won’t break the bank? Ernie’s Rapid Lube has been providing such service for the last 31 years to local residents, and you won’t have to drive farther than Chehalis. "We stand behind our work and our parts," said owner Ernie Schmitt, whose business has been awarded Best of Lewis County by The Chronicle newspaper five times in the last decade for oil change services.